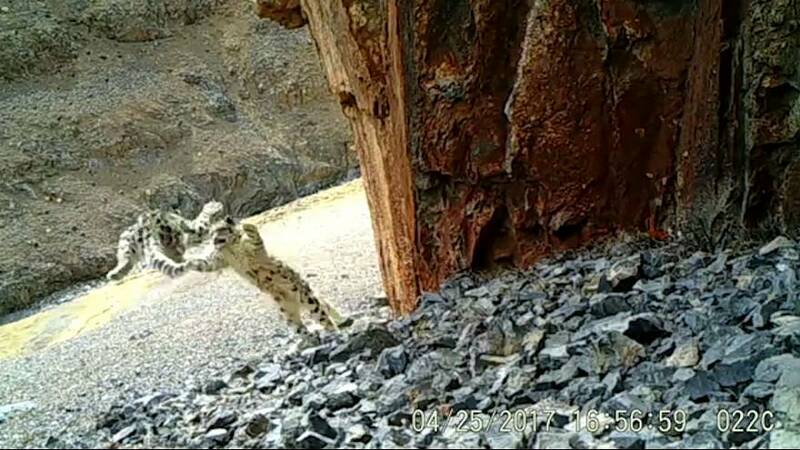 Rare footage of two young snow leopards in the wild has been released. The pictures, captured by the Wildlife Conservation Society and the Conservation charity Panthera, shows the cubs acting playfully in the Tibetan mountains earlier this year. It comes after the International Union for Conservation of Nature (IUCN) said the conservation status of snow leopards had changed from ‘endangered’ to ‘vulnerable’. The species was first added to IUCN’s red endangered list in 1986, according to the Snow Leopard Trust (SLT). But the trust says the snow leopard still faces a high risk of extinction. “The change does not reflect a measurable improvement in the cat’s overall situation,” SLT said in a statement. “Instead, as IUCN writes, it’s based on a ‘revised estimate of the number of mature individuals’, and addresses what they refer to as a mistake in the previous assessment. The World Wildlife Fund’s entry for snow leopards reads: “The elegant and well-camouflaged snow leopard is one of the world’s most elusive cats. Thinly spread across 12 countries in central Asia, it’s at home in high, rugged mountain landscapes. But poaching and climate change are now threatening its survival.